Rich send us these pictures of his Smoothie built up with some red Fulcrum wheels. The red is a nice accent to the black and white theme. He's also running the Soma Highway 1 road bars. Thanks for the pics Rich! Looks like a fast bike! At our request, our Northern California distributor decided to make a consumer version of their catalog available to the public for download. Take a look at some of the new products available from Soma for 2013! Thanks goes out to Manny Acosta on Flickr for the cover photo! 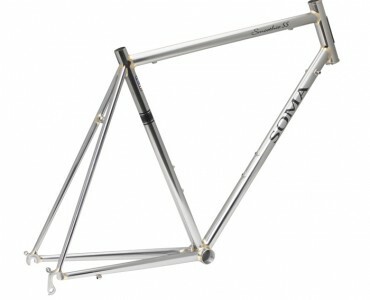 We've had a few emails asking if it is possible to convert the Soma San Marcos 700c frame to 650b. Of course the smaller versions of the San Marcos are designed for 650b, however the larger frames have a lower bottom bracket, which can cause issue when moving to a smaller wheel size. There is another option though. While less talked about these days, 650a also know as 26x1 3/8" can be used to give your 700c SM a little more cush. 650a is nominally halfway between a 700c and a 650b size rims. There are actually quite a few good tires still available in this size from Michelin, Kenda Schwalbe and others, but the absolute best option IMO is the Panaracer Col De La Vie 650a. It's essentially the same as the 650b version, but fits on a 590 ISO rims. There aren't as many good rims choices, but there are a few. The Sun Cr-18 is the most common, but there's are also the Araya SP-30 and the Velocity Synergy (not currently in production but NOS rims are out there). This is great news for anybody with a Nottingham Raleigh Three Speed or a classic Japanese Randonneur that's built for 650a rims, but also for anybody looking to retrofit a bike with longer axle to brake bolt measurement such as the San Marcos or bikes made for 27" wheels. 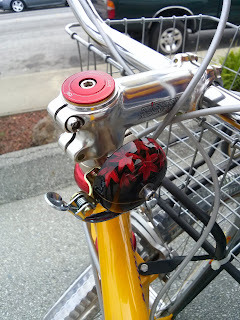 Most of the brakes that work for 650b conversions should also work with this trick. 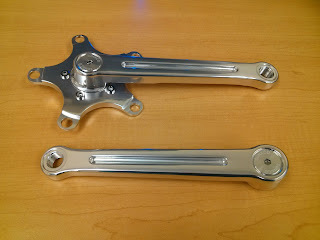 My favorite options are the Rivendell Silver dual pivots and the Dia Compe 750 center pull calipers. 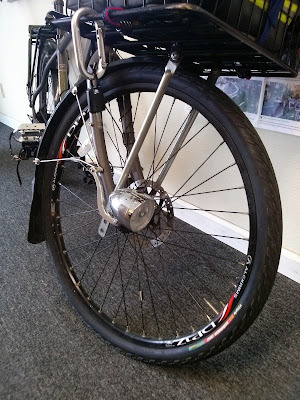 If for some reason that won't work on your frame, there's always the option of Sturmey Archer drum brakes. More info about those can be found here www.sturmey-archer.com/products/hubs. If your local bike mechanic gives you a weird look when you ask about this stuff, just point them to our distributor in San Francisco and they should be able to help out. It looks like there's also a Flickr groups dedicated to this tire size now. We take pride in designing frames that are versatile. Here's an example of one way to set up our 650b MTB frame, the Soma B-side. Plenty of stand over clearance on this one. 650b is really the perfect all-rounder wheel size. Thanks to Mark in NJ for sending us pics of this build. "Taking a deep breath, holding the handlebars tightly from the left side, I give a good push into the water and the front wheel rolls forward and then drops so far down that the water is nearly rushing over my front panniers. The drop causes me to be pulled further into the water than anticipated. My heart skips when I realize that the wheel is not even touching the ground. Water is up to the bottom of the rear panniers and up to my knees. I can feel the front of the bike wanting to be whipped down the river. Nellie behaves like a buoy and I think if I can press the front down, it will help stabilize it.But this doesn’t work and the further the front goes down, the greater pressure I feel from the river pressing my bike against me." 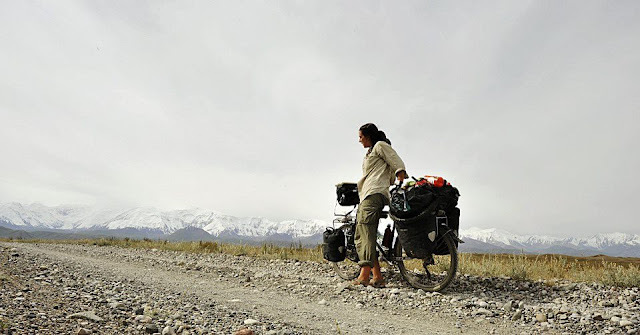 Eleanor Moseman began cycling Asia in the Spring of 2010 and has just completed 15,000 miles through 7 countries. She incorporated her photography to document the communities and peoples of the Western borderlands of China, including Tibet, Xinjiang and Central Asia. New Sanyo Dyno Lights from Merry, originally uploaded by rperks1. 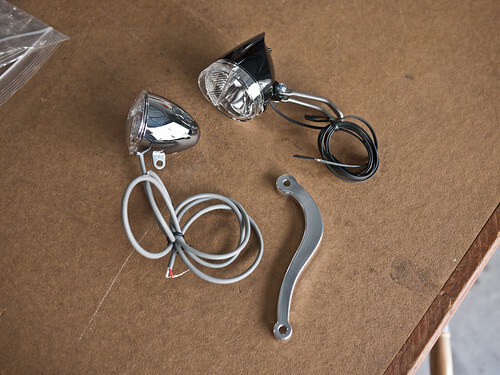 Hub, light and Soma Wingmann mount now available on the SomaFab shop. For those of you not compulsively refreshing the Soma Store page, here are a few products that you might have missed. Meet the Soma Brevet. Similar to the Nitto Randonneur, it features a flared drop and an up-swep top. These are almost as nice as the Nittos, but at a more affordable price. They feature a traditional 25.4 (that's 1 inch in American), but of course you can use a shim to fit 26 and 31.8 stems. 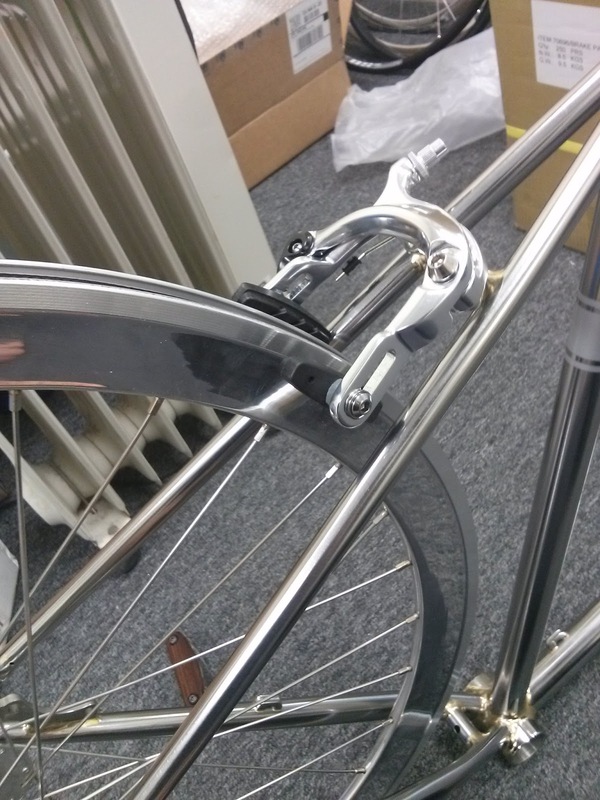 These are ideal if you prefer a longer, flatter ramp above the brake levers. 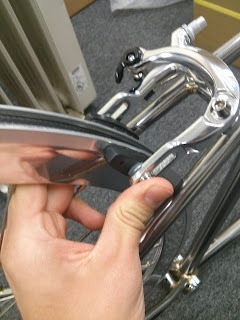 They also work great with guidonnet reverse style brake levers. 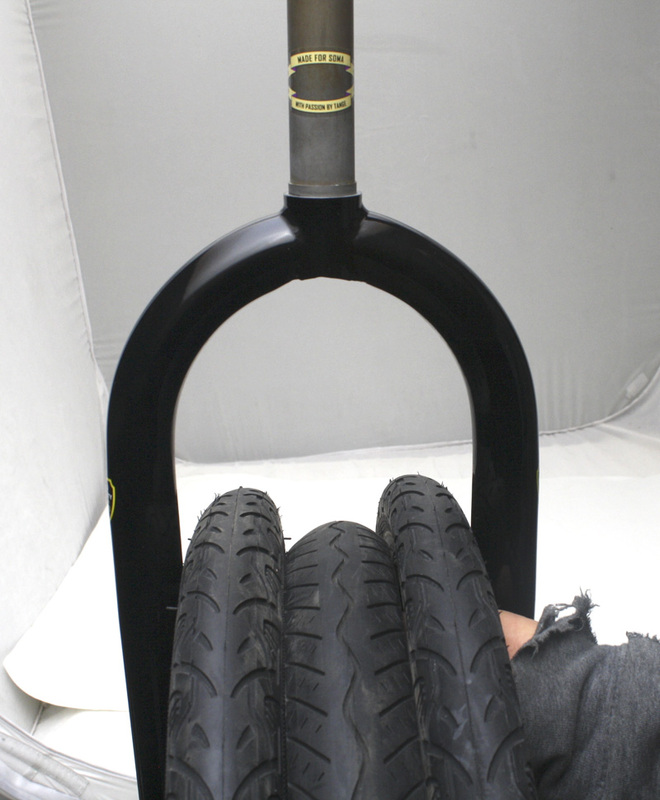 Better yet, they're available in 38-46cm sizes, so no need to worry if they'll fit with your handlebar bag. A second version with a more modern ergo style drop is in the works too. You asked us for a 26mm version of the June Bug bars, and at long last here they are. We call them the Portola, named after the neighborhood in San Francisco Rumor has it there's some fun single track around them parts if you know where to look. Anyway, if you didn't know, this is a dirt drop style bar. Made for offroad riding; they'll work best jacked up so the grips are level with the saddle. If you're stem isn't quite up to the task, take a look at the new Soma High Rider stem options and the new 280mm Nitto Technomic quills stems for those of you running a threaded setup. 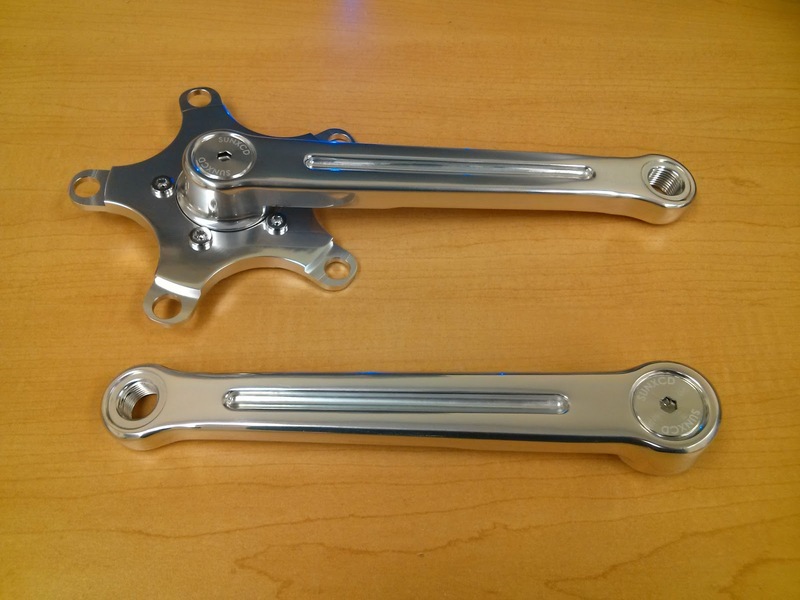 In general I like to think I know pretty much all the products we carry, but when I was talking to Rob from Ocean Air Cycles the other day he was singing the praises of the Nitto RM-013 Dirt Drop bars. And I confess, I'd never really looked at them before. From the pictures alone, they don't look all that different from other dirt drop bars on the market, but Rob swears by them. Turns out we have a brand new 31.8 version called the RM-014. What really sets these apart from other dirt drops is the shape of the 'hook' so to speak. They're shaped more like a traditional road bar but flare out at the tips. This gives you a nice hood position for climbing/cruising along, and a super stable drop grips that puts your wrists at a more comfortable angle for serious trail riding. Give them a looksie. You might fall in love. If you can recall a while back, we posted pictures of a prototype headlight mount thingie dubbed the 'Wingmann'. Well they're in stock! We've tested them on a few of the bikes that our employees ride to work and found a number of good way to use them. 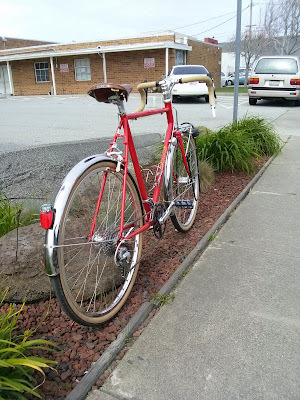 Of course we intended them to be mounted to the brazed on eyelets that come on the Nitto front racks (they work under the Soma Porteur rack too! 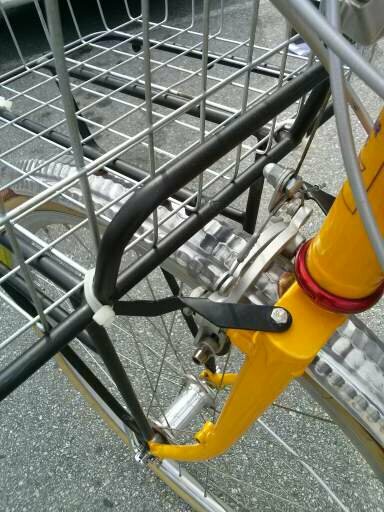 ), but they can also be mounted to the fork if you want to get the light closer to the ground, or you don't have a front rack. You can attach a Nitto Lamp Holder 3 and have an adjustable perch for a Cat Eye/Planet Bike/Priceton style headlight Here's Adrian's commuter with the Torpedo headlight mounted to the mid blade fork eyelet. Well, that's all for now! Check back for more new stuff coming in soon! 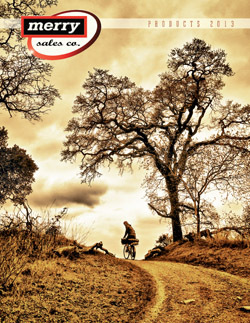 Bicycle Touring New is now carrying a few models from Ostrich Bags. Rob from Ocean Air Cycles stopped by today to pick up a few Soma tires and some new Sanyo dynamo lights. He had a couple of his bikes in the van and was nice enough to pull them out so we could take a closer look. White Industries cranks and brazed on Paul centerpull brakes look super clean. 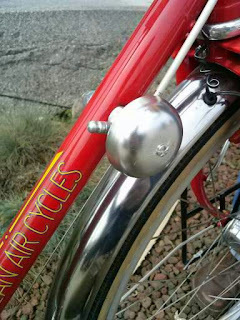 On closer inspection, you'll find these bikes are chocked full of clever little hacks. The Rivendell Marks rack by Nitto bolts directly to the fork crown braze ons. He's not a giant, it's just a little bike. This one is the model he built for his wife. Ocean Air is big on 650b. These bikes are both running Soma 650b tires. 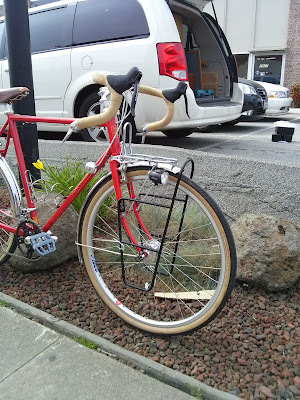 This one has a customized Soma Porteur rack with a Wald basket attached to the front. 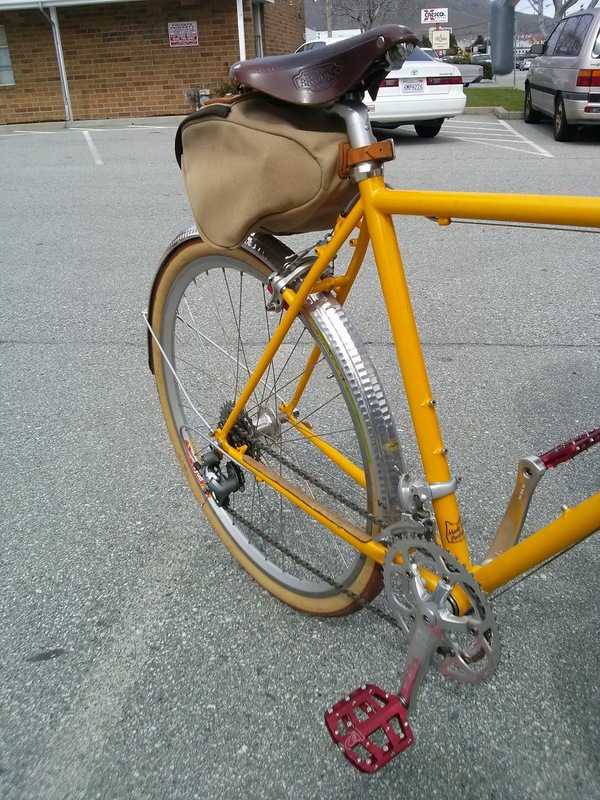 The hammered Honjo fenders look sweet with the Terra Cotta Soma B-lines. Custom tabs connect the rack to the fork crown. Crane Karen bell mounted on top of the down tube housing stop. Never seen it done like that before. Customized mount for the Crane hand painted bell mounted to a headset spacer. Can't wait to see what's next from Ocean Air. You can find more info at the website. 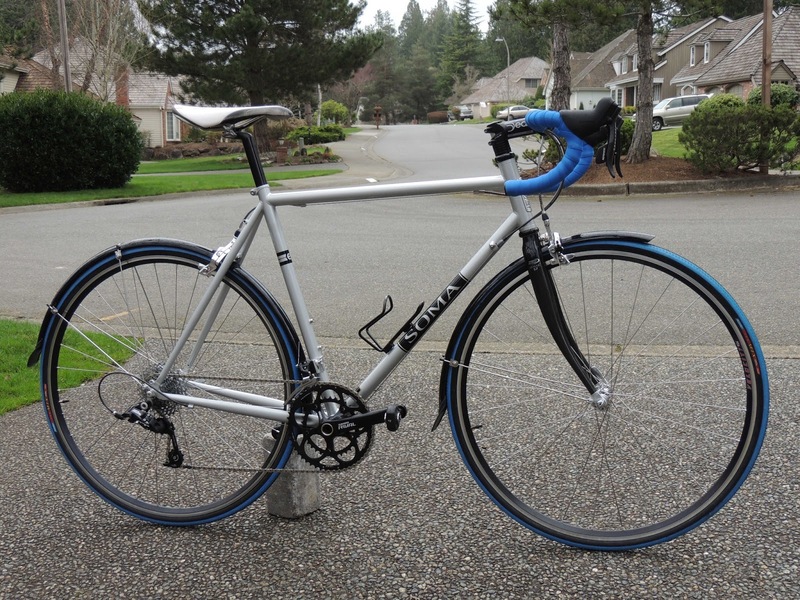 Pete in Seattle just sent in this picture of his new Soma ES build. Look like he went with a Sram Rival build. 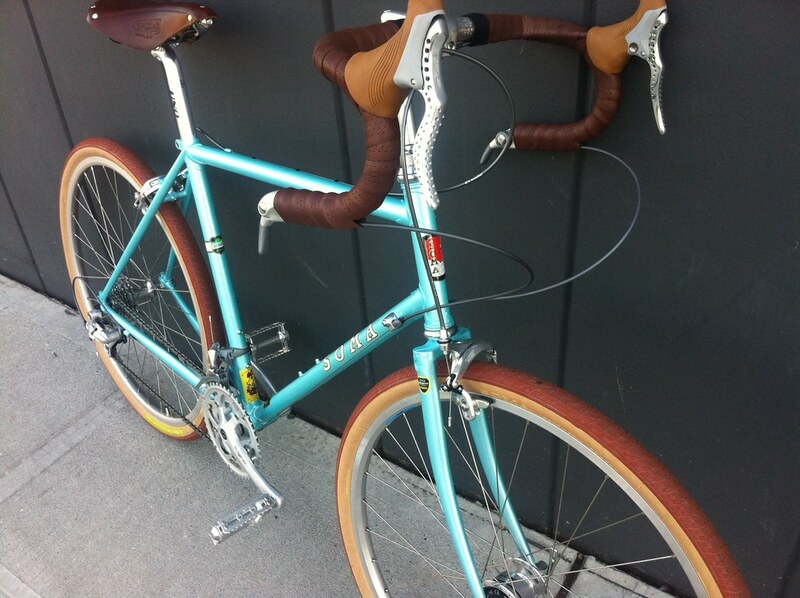 Plenty of room for fenders thanks to the IRD Mosaic 57 carbon fork. Who says it's the off season? Chris from Poland send over these pics of his Soma Analog build up as a geared hardtail with skinwall tires. Check it out! 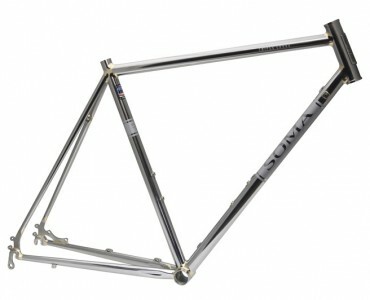 Official pages for the new Soma Stainless frames now online! You've been waiting! Now you can read all the details. Click the links to take you to the complete product pages on the Soma Mothersite. Triple Cross is available in 56cm right now! Smoothie SS in 58cm. More sizes on the way. Shops can order from our distributors now. *SOMA* tradesman complete bike, originally uploaded by Blue Lug. 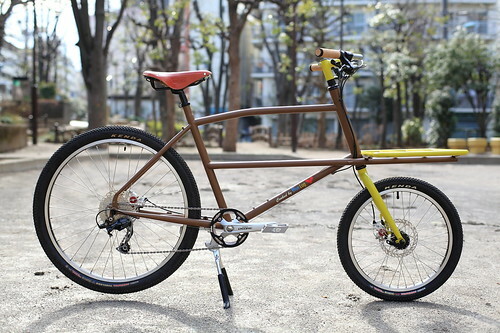 Soma Tradesman custom painted by Blue Lug in Japan. Loving the colors! Square taper cranks are back baby! We just got some new samples from Sun XCD in Japan. Sun XCD is a new company that was started by the original president of Suntour and other Suntour colleagues, and they're ramping up to start producing top quality, traditional style components for touring and randonneuring. These cranks use a traditional french style 50.4 BCD with interchangeable spiders for 110/74bcd and 130/74bcd chainrings. 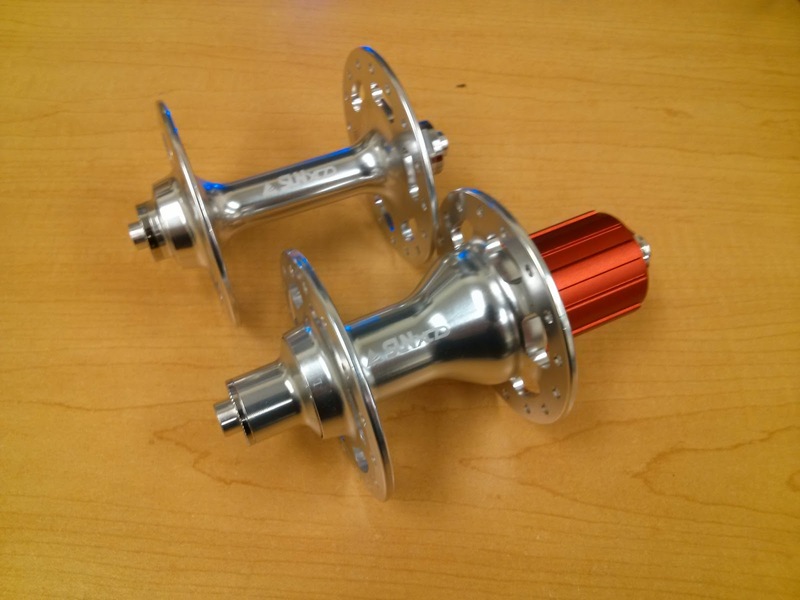 They're also making these classic high flange hubs. The bearings are sealed cartridge style. Works with Sram/Shimano style cassettes, including the IRD Campy Conversion cassettes. We'll be stocking these as soon as they're available. Stay tuned for more details. 2 out of 3 of Kevin's stolen bikes have been recovered. 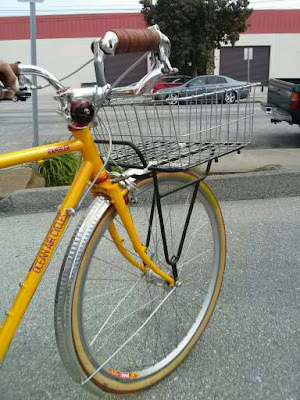 The Pick Up Artist proto was found abandoned outside a liquor store, and the Schwinn Voyager was recovered from someone who bought it. That leaves just the Celmins unaccounted for. Luckily it's a one of a kind custom bike so it should show up eventually. Keep yer eyes peeled for this lugged steel road bike in red and white fade paint. If you see it let us know! If you're not a serious bike nerd you may want to take a pass on this one. If you are, then listen up. 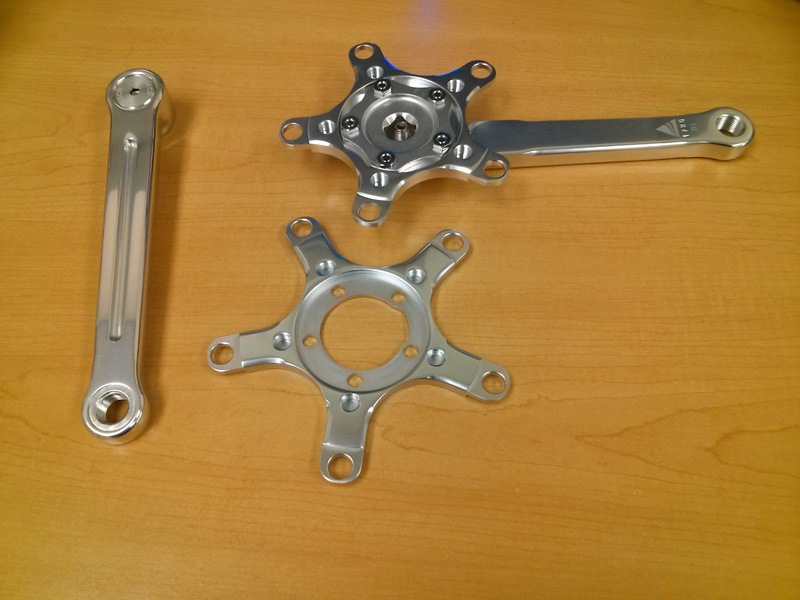 Now that we have the new Triple Cross stainless frames in stock we pulled one out and threw an IRD B76 caliper on it and voila! It works. The pads are at the very bottom of the slot, so other brakes like the Tektro R559 which have a shorter reach probably won't work for this trick. Now before the disc brake mafia get's up in arms about stopping power, we know okay! You'll get better stopping with a disc brake than a super long caliper. But somtimes there are situations where you have all the parts from another non disc build and you want to get it finished and this trick will make it all come together. IRD sell this brake singly so no need to buy an extra if you only need the rear. The brake bridge even takes a recessed brake bolt, so no need to worry about using a nutted caliper. 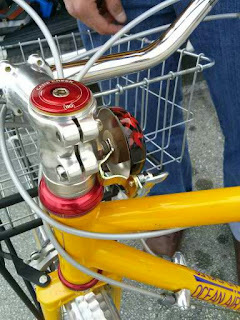 FYI, if you like this setup, but you want a little more stopping power the new Dia Compe 750 recessed centerpull brake should also work if you use a cable hanger mounted to the seatpost binder. In light of all the Fat Bike frenzy coming out of this years NAHBS show we thought we would share something we've been working on. This is a 135mm O.L.D. 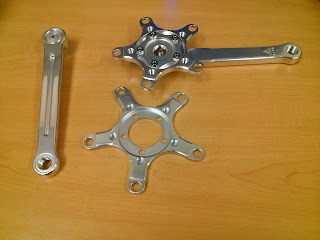 version of our venerable Juice 29er fork made by Tange. It features low rider and fender eyelets and a copious amount of tire clearance. To illustrate our point, here a picture of it with three tires inside. As you can see there's room to spare. Now before you ask, no we aren't making a fat bike. No yet anyway. This is a 29er fat front fork. The axle to crown is identical to our standard 29er fork, so you can run a single speed rear wheel on the front for regular trail riding, and back country touring. Then when you're ready to get gnar you can swap it out for a fattly shod 26" wheel and hit the big stuff. Since this is just a sample we'll need to put some miles on it before we offer them up to y'all, but don't worry, we'll keep you in the loop. Respect to Jeff Jones for pioneering this kind of nonsense. 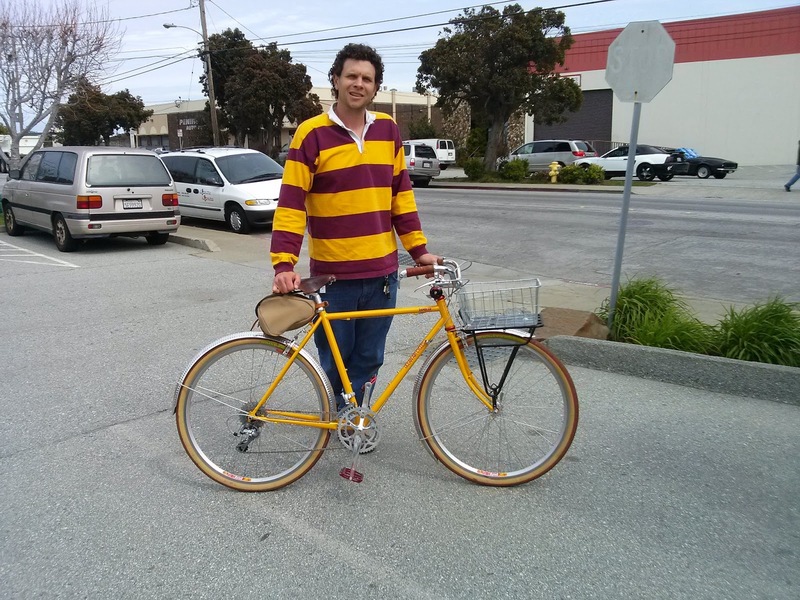 One of our employee had three bikes stolen from his backyard in San Bruno yesterday. Among the bikes stolen was the one of a kind V.1 Pick Up Artist prototype. We haven't shipped any of these yet so as of right now it's the only one anywhere outside of our warehouse. 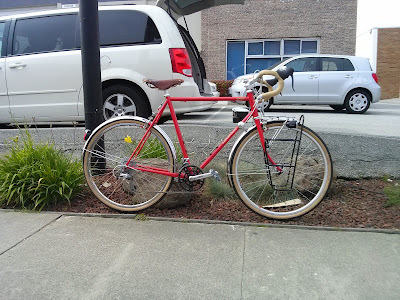 The other two bikes were a custom built Schwinn Voyager with a Cardiff Saddle, bar end shifters and Soma Terracotta tires. 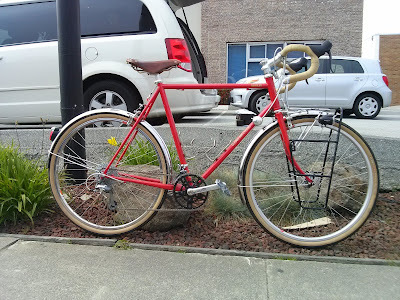 The other is a custom built handmade Celmins road frame also sporting some Soma Terra Cotta New Xpress tires, Rivendell Downtube Shifters and Soma Highway 1 Bars with an IRD stem. If you see any of these bikes, or you have any information that could help of track them down, hit us up at somainfo (at) somafab.com or call our toll free number 1 800-245-9959 and dial 1 and ask for Evan. We will hook you up with some Soma schwag for your troubles. These are all very unique bikes so keep your eye open and pass the word along. Please share on Twitter, Facebook, Google + and anywhere else you can think of! A great interview here with Eleanor who traveled across Asia on a Soma Saga.